Forget pasting analog sticky-notes to the sides of your monitor. They look terrible there, and they always fall off anyway. Instead, paste digital stickies to your Windows desktop. If you're a Windows 7 user, it's a snap: Just run the new Sticky Notes app. You might recognize it from the ol' Vista Sidebar. In Windows 7, Microsoft ditched the Sidebar but kept the gadgets, allowing the latter to reside anywhere on your desktop. To run the app, just click Start, type sticky, and press Enter. You'll immediately see a new note; just start typing whatever it is you need to remember. Need another note? Click the plus sign on the first one. Want to delete it? Click the x in the opposite corner. Prefer a different color. Right-click in the body of the note and choose from six options. Remember that Sticky Notes is an app, so your notes will stay on your desktop only as long as the app is running. If you close it (by right-clicking the taskbar iconand choosing Close window), Sticky Notes will restore your notes the next time your run it. This is a decidedly barebones program. You can't change the font size, adjust transparency, or force notes to stay on top of other programs. If you want that kind of functionality, try Stickies for Windows. 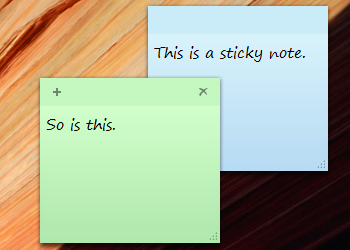 Still, Sticky Notes can really come in handy when you need, well, a note that sticks to your desktop.